Fiona Apple has just released a new record for the art-minded. As is her bent, she’s given it a really long title… The Idler Wheel Is Wiser Than the Driver of the Screw and Whipping Cords Will Serve You More Than Ropes Will Ever Do. But if anything, it’s a short title compared to her second record. 5/5 – “Every Single Night” the preview single from the record. A very quiet song, with a lot of compressed ideas and a somewhat rapid-fire delivery of lyrics. She contrasts the free-flowing lyrics with sparse, music box-like textures and found-sound percussion. So cool! I can’t wait to see this live! 5/5 – “Johnathan” a masterfully eerie, minor key thing with a vaguely Grusin piano part. Seems to be about her ex, Jonathan Ames. I don’t know enough about the backstory to say anything intelligent about this…but what a strange, awesome song! On many of the songs, she’s singing with enough intensity to distort her normally very smooth, sultry voice. The grit and gravel she chews on songs like “Daredevil” and “Regret” really pay off. Those songs create some of the most satisfying, pained moments in the collection. I strongly recommend this one for anyone who loved the sparse, dry qualities of James Blake’s self-titled album…this unfolds in a similar way. Also, Tom Waits fans my find a kindred spirit here. The quirk and instrumentation on display is of a similar aesthetic. 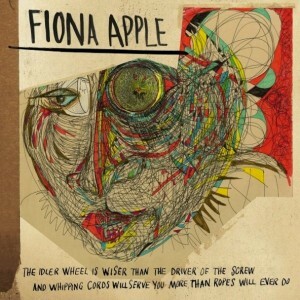 And to Fiona fans, prepare for her to push the boundaries…this isn’t the angst pop of old, but its well worth exploring. Fiona has proven herself no longer an angry 90s pop star, but an artist evolving. Time to let “Criminal” and “Sleep to Dream” lie. Those were great songs in their day, but she has moved on. And I’m cheering her on every step of the way. Last bit…get it on iTunes. Normally, I’m a firm believer of CDs or vinyl, so its weird to be saying that, but this collection is a definite exception to the rule. The “mastered for iTunes” thing sounds great, the bonus track “Largo” is one of the better cuts, and the 5 included videos are from her wonderful SXSW performance. Additionally, the iTunes LP artwork and interactivity is very cool! This is the first full album I’ve ever listened to by her, I like the style. She reminds me of a more instrumentally-diverse Regina Spektor. “Every Single Night” is definitely the stand out, I love intro tracks that seem like they were built to tell a story about the entire album (“Some Nights (intro)” by Fun. is my favorite similar example).